We are on a mission to help you become the best scientist you can be. 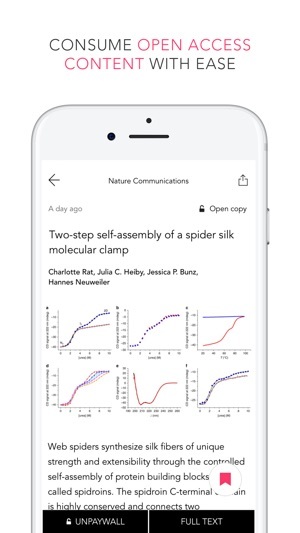 The RESEARCHER team is striving to make it easy and efficient for you to find and read new papers that are vital to your research and teaching. Create a personalised feed in two minutes. 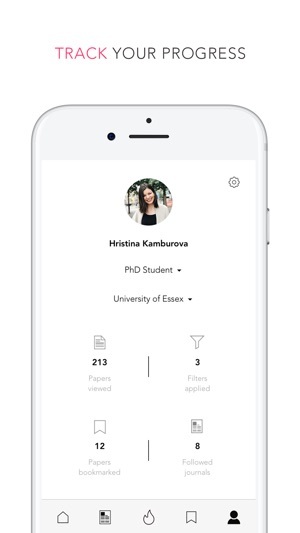 Choose from over 9,000 academic journals covering ten research areas then let RESEARCHER deliver you papers tailored to your interests each day. RESEARCHER is always up to date. We add thousands of papers each week as soon as they are available from publishers. RESEARCHER is comprehensive. We have 9,000 academic journals based on impact factor and constantly expand our coverage. RESEARCHER simplifies the discovery process. We understand the pain points related to keeping on top of an overwhelming amount of published work. That’s why we created filters, notifications and bookmark libraries. RESEARCHER is constantly growing and evolving. Over 650,000 researchers are part of a burgeoning community representing over 180 countries with more joining each day. Every week we release new content and improvements to our app. RESEARCHER is free. Create an account that syncs with the web and start browsing papers whenever and wherever you are. 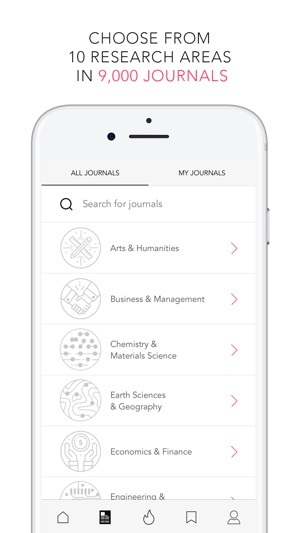 Choose your favourite journals from a list of thousands of titles. When new papers are published they will be immediately delivered to the feed you curated. Filter your feed by applying specific keywords or author names to easily find the papers relevant to your research. This saves you from setting up alerts, complicated RSS readers and manually browsing multiple journal websites. Bookmark papers to read later on mobile or desktop. If you’ve saved dozens of papers, you can quickly find them by searching for the author, journal name or paper title. Prefer to read on your desktop? Go to www.researcher-app.com and your settings will be synced. 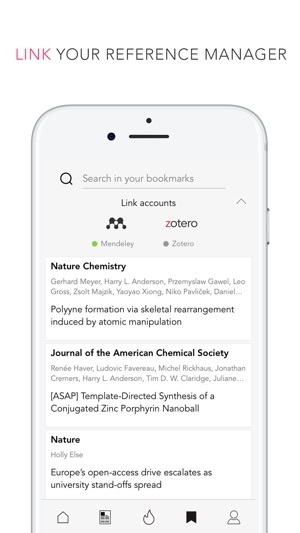 Connect your Mendeley or Zotero account and you can see your bookmarked papers in a folder in the library of your chosen reference manager. (We are adding EndNote, RefWorks and other reference managers soon). Want to know when journals critical to your work have published new papers? How about the top paper you shouldn’t miss based on your interests? Simply turn on notifications in the settings. Are you a Chemist that enjoys reading the odd Political Science paper in your spare time? 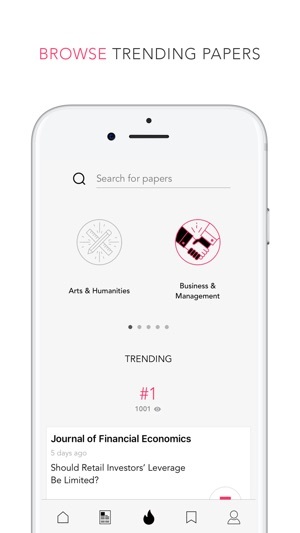 Browsing the trending papers zone allows you to see which publications are getting traction in all 10 research areas and 200+ subjects covered by RESEARCHER. Our integration with Unpaywall provides you with a simple way to read legally published open access content. Simply look for the open padlock icon on papers and you will have the opportunity to link to the full copy or download the PDF (if available). Regularly receive papers from friends and colleagues via email, Twitter and various other mediums? Streamline your communication with individuals or groups by sharing important content without leaving the app. Disclaimer: RESEARCHER aggregates the abstracts of recently published academic papers. The content includes a combination of open access papers, pre-prints and copyright protected articles behind a paywall. In order to access paid content, users must have valid institutional credentials or provide payment to the publisher. Please email us on info@researcher-app.com or leave a review to give us your feedback! Do you find yourself doing a lot of paper browsing at night? This release will be a boon for your tired eyes. Simply go to Settings and set the ‘Night Mode’ toggle to ON. The app screens will transition from light to dark and make burning the midnight oil much more enjoyable. 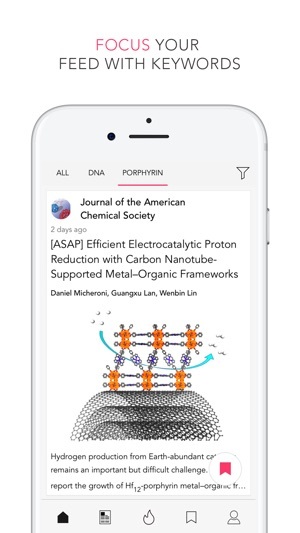 Useful app to follow all the new articles published in scientific journals and really nice feature to look for key words, which at the end seems better than a google scholar notification, and to be honest just more natural than reading a “newsletter” type stuff from gscholar. However, even if the main features are here, I think some useful things would be interested to implement, like putting in greyish the articles already seen (which makes it able to see where we left last time we update the research) and the possibility to have push notifications for the keywords selected. The “my article” are linked with Mendeley, which in my opinion is a limitation as many people don’t use it (part of it because it is owned by Elseveir) so it could be great to link it with a zotero account (although I am not familiar if there is any API limitation for that...). Also I noticed that some journals are missing (such as Optica) which makes me still stick with arXiv newsletter + google scholar email notifications on keywords. Research at your fingertips!! 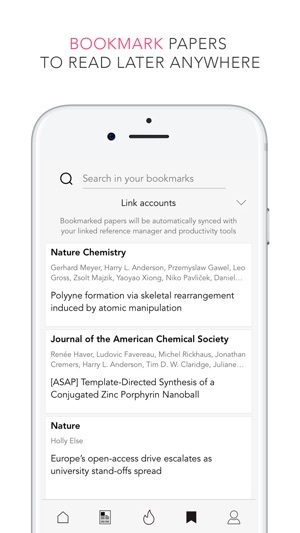 Instead of sifting through search engines trying to find articles most inline with my profession, this app allows me to pick and organize my preferences to narrow my research!! I’m a dietitian so staying up to date with research is so important. With this app, i can do it quickly and easily without having to take the time to scroll through google or Pubmed to find articles. Cuts my research time in half. In addition, i really appreciate the option to only view full text articles. Lastly, a Researcher team member emailed me to offer help with functions or questions i had. I feel comfortable navigating the app and will continue to use in my practice! Answer to developer: I am using an IPhone 6S with iOS 11.4.1. When I start the app, it shows my feed and the loading symbol with the three rotating:pulsing dots - they just never stop rotating. Hope you guys figure these issues out and I’ll be happy to come back as a user. EDIT: it currently absolutely unusable, keeps crashing every time, so I uninstalled the app and changed to 1 star. It’s a bummer, was really excited when I found this app. 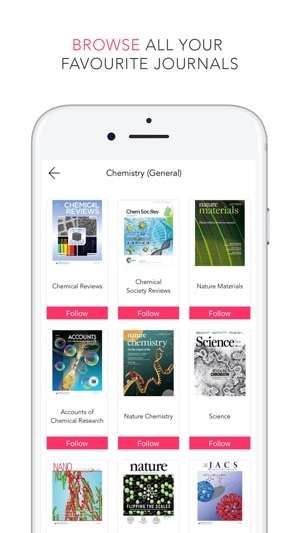 Love the concept of this app - as a scientist it could make for a really convenient tool to stay up to date on relevant literature. However, the app has a lot of problems. Several times now I had to reinstall it because it kept crashing even after I shut it down. That obviously stops me from actually using it- improve the user experience and this will be a 5 star no question.